I find the aphorism 'do what you love and you'll never work a day in your life' to be true for me personally. I've had the desire from a young age to find a way to help others improve their health through nutrition, and after considering many potential career paths in the broader fields of healthcare, which along the way included obtaining a degrees in biomedical engineering and another in biochemistry, I found my way into agriculture following college in 2012. Agriculture is really the heart of it all. As a farmer selling produce packages directly to members of my community I can help them, one carrot at time, eat their way to a more healthful tomorrow. Though society has found many creative alternatives to gleaning nutrition from fruits and vegetables, there are no magic pills, supplements, or pharmaceuticals that can improve one's health as much as a daily dose of plants. That is why I've decided to focus all of my energy answering the question- how can I help members of my community consume more fresh, nutritious fruits and vegetables? That passion led Jimmy and I to establish Front 9 Farm in 2015, and continues to lead us to push ourselves to grow better plants, using better techniques, and highly tailored technology. Though farming is one of the most established industries, highly rooted in its ways, and a more lucrative path in life could have been chosen, we don't see it that way. Through farming we see an enormous opportunity to help the people of our community, and we see tremendous room for innovation. We're a couple of farm-trepreneurs who need the support of our community to reach our full potential. Please consider purchasing our CSA package for you and your family as both an investment in your health, and your future, as well as ours. Last year, we were so pleased to attract such nice people to our CSA program, and we genuinely enjoyed getting to know each and everyone of them throughout the season. We've felt very encouraged by the support we've received in the community. In 2016 we grew all contents of our CSA package and distributed the CSA shares to members in Medina and Cuyahoga counties. Our 2016 Two-Person Omnivore CSA Share was $625 ($25/week) for the 25-week share. The share included 6 pasture-raised broiler hens which averaged 5.5lb (33lb valued at $3/lb = $99), 8 dozen free-range, farm fresh eggs (valued at $3/each = $24), and 13lb (average) of produce, which equals a value of $1.54/lb of produce throughout the season (valued at $502, or $20/week). Throughout the season over 70 different crops were included, and 2-3 recipes were included in the weekly newsletter, as well as details of the vegetables in the share. We're proud of what we accomplished in 2016, and we're dedicated to improving the produce quality and variety that we offer in the future. We are looking to grow our membership for the 2017 season. This season will run 26 weeks beginning the third week of May and ending the second week of November. The price is again $25/week for the 2-person omnivore share, for a total of $650, and will include 6 dozen eggs and 6 broiler chickens throughout the season, with add-ons available at pick-up. We identified what we felt were weaknesses in our 2016 program. We felt some vegetables were repeated too often, and others not enough, so we've reorganized our crop production to strike a greater balance among crops for which we received feedback from our members throughout the season. 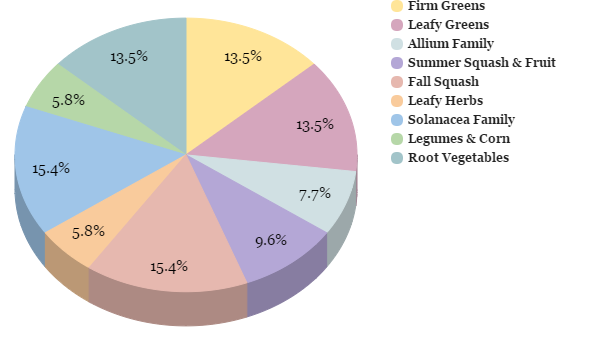 Our Crop Breakdown page has details on the relative quantities of vegetables we hope to grow and include in our CSA share, and this chart will give you a rough idea of what we hope to include this season. Through crop and recipe selection we're working to find a balance of produce items which easily transform into satisfying weekly meals. This year we will rotate through 125 unique crops, some of which are only included in small quantities while others will make up a greater percentage of the shares. These crops represent over 20 different plant families, each of which has unique phytonutrient and antioxidant profiles. Crops in the 2017 CSA which were not included last year (should) include sweet corn, broccoli, cauliflower, cantaloupe, honey dew, as well as an expanded variety of carrots, potatoes, hot peppers, and many more. We want to thank all those who support our farm for allowing Jimmy and I to pursue our passion. We've chosen this path because we want to provide a nutritional foundation for members of our community. Diets rich fruits and vegetables lead people to live healthier and longer lives.